A friend of mine directed me to your recent story "Sensei's World," published on Forbes.com. I'm not sure if the story is also available in print form. As a fellow journalist, I'm quite concerned by the flagrant lack of objectivity in your reporting. Of all those you chose to quote and feature in your story, every single one of them was unabashedly anti-Gakkai. How such shoddy leg work, narrow perspective, and obviously mean-spirited accusation can be passed off as journalism is beyond me. As a regular contributor to Hong Kong's South China Morning Post, a newspaper with a smaller circulation and less international acclaim then Forbes, I too have submitted stories where sources were shaky, facts were unsubstantiated or uncorroborated and my own personal bias ran too deep. My editors have always told me to come back when I've got my facts cold, when my sources are solid and when the piece is clean. The slanderous accusations you make in "Sensei's World" are rife with the same kind of partisanship that you have unsuccessfully accused the Gakkai of. It's a shame that such work can be called journalism and an even greater shame that a few people may actually believe it. 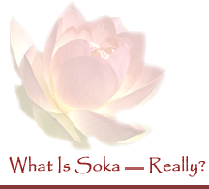 I am a proud Soka Gakkai member and I can tell you that Soka University of America is as much my university as it is Daisaku Ikeda's. The Soka Gakkai does not belong to Daisaku Ikeda; it consists of all of us who advocate peace, culture and education through the spread of Nichiren Daishonin's Buddhism. Although you never outright accuse Daisaku Ikeda of siphoning funds from the SGI, your story is loaded with this type of insinuation. I wonder what could have made you so bitter and what could have made Forbes so negligible in allowing this story to run. In your piece you attach the word "tithing" to the SGI's method of collecting contributions. Do you even know what a "tithe" is? It's a mandatory ten percent contribution to a church. In the Soka Gakkai, there are no mandatory contributions. In "Death Watch," your insinuation that no one can successfully bring charges against the Gakkai is so far off the mark that I'm sure even anti-Gakkai Japanese who read English would cringe if they came upon it. The Gakkai is attacked constantly in Japan, by media, law enforcement and politicians. We always have been. I write this to you, not as an official representative of the SGI but as a practitioner of Nichiren Daishonin's Buddhism who'd like to give you a chance to save yourself from the negative causes you've made. I'm requesting that you print a formal apology and a retraction notice and I will be sending this letter to your editors at Forbes. In the short run this may help you avoid a nasty libel suit and, in the long run, may enable you to once again call yourself a journalist. As things stand now, you and Forbes have given innocent hacks a nobility they neither asked for nor deserved. I leave you with one simple thought; "Sensei's World is My World." See also another response by an individual.